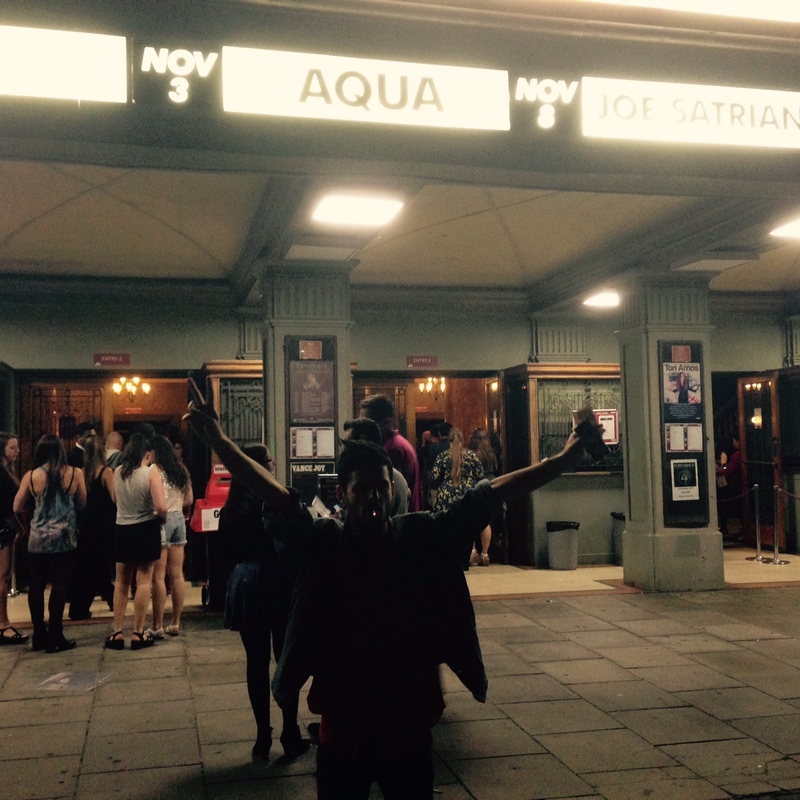 Danish pop legends Aqua returned to Australia for their ‘Greatest Hits Tour’ and we were very unsure as to what to expect before arriving to The Palais Theatre on Monday night. It’s been seventeen years since the release of their catchy yet cringe worthy smash ‘Barbie Girl’ the song which we thought would be both the beginning and end of Aqua’s career. Apparently not. The crowd was warmed up with nostalgic hits blasting from the speakers before Lene, Renè, Soren and Claus arrived on stage to perform a track from their 2011 album Megalomania (We didn’t know this one existed either). The four piece ignited the excitement within every audience member when the first hit of the night was delivered in the form of ‘Dr Jones.’ For a moment the crowd mainly consisting of gay men and Barbie girls were taken back to the days of their youth and the Palais turned into a sweaty Eastern European night club. The evening before the Melbourne performance Aqua had to cancel their Adelaide show due to the lead singer, Lene, coming down with the flu. Despite this she proved she was still an A Class performer and managed to get through the set by taking just two short breaks in an attempt to get her throat operating again. The most surprising aspect of the show was the lack of lip-synching. What we expected was washed up pop stars desperately holding onto their position in the fame game on a stage filled with ornamental instruments as they shuffled awkwardly to a backing track. What we got was the complete opposite of our expectations. Aqua gave an incredibly energetic performance that had the crowd roaring for more. Although the focal point of the pop group is it’s one and only female Lene Nystrøm, the real star of the show was the living Ken doll, Renè Dif. After Nystrøm made a hasty exit from the stage to tend to her damaged vocals Dif was left abandoned on the stage to keep the crowd entertained. At first he seemed a bit lost for words, asking the crowd for suggestions as to what he could do. Then without hesitation dived right into the audience to answer any questions, take a million selfies and run around the venue. When lead singer Lene finally returned to the stage and the intro to ‘Barbie Girl’ began every member of the crowd reached their peak of excited and stood on their seats, screaming the lyrics as loud as their voices would allow. Just when we thought the night couldn’t get any more thrilling members of the hyped up crowd were invited to join Aqua on stage for their final track ‘Roses are Red.’ At first there was just five either very brave or very drunk audience members gyrating up against any member of the band they could get close to. Then without warning more and more fans piled onto the stage to create one very epic dance party, which was a rather appropriate ending to a strange show. Overall we were pleasantly surprised with what Aqua delivered. Regardless of illness or the ‘has-been’ status this band proved they still have the ability to make a crowd go crazy and that 90’s pop music still has a place in 2014. This entry was posted in live music, music and tagged 90s music, aqua, barbie girl, live music, melbourne, music. Bookmark the permalink.